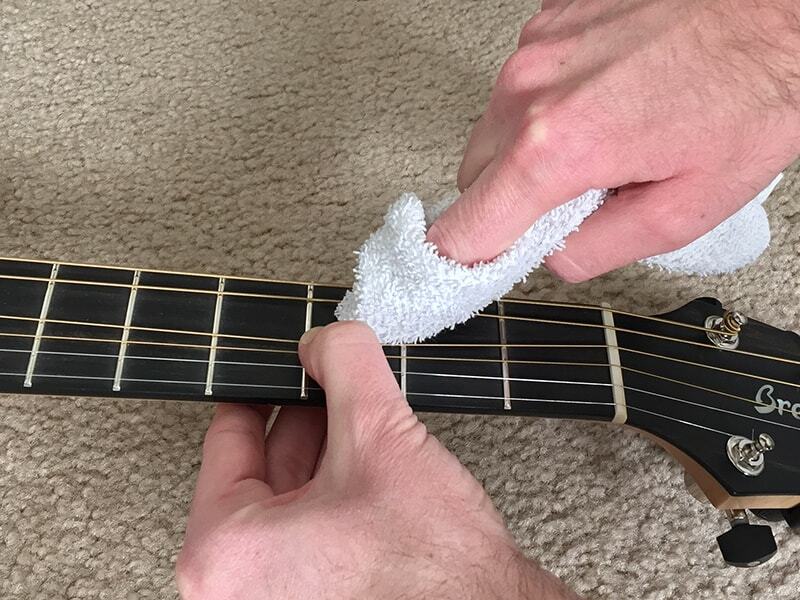 Get in the habit of doing this simple maintenance task, and not only will you have to change your strings less often, you’ll extend the life of your guitar and avoid bigger repair/maintenance bills down the road. 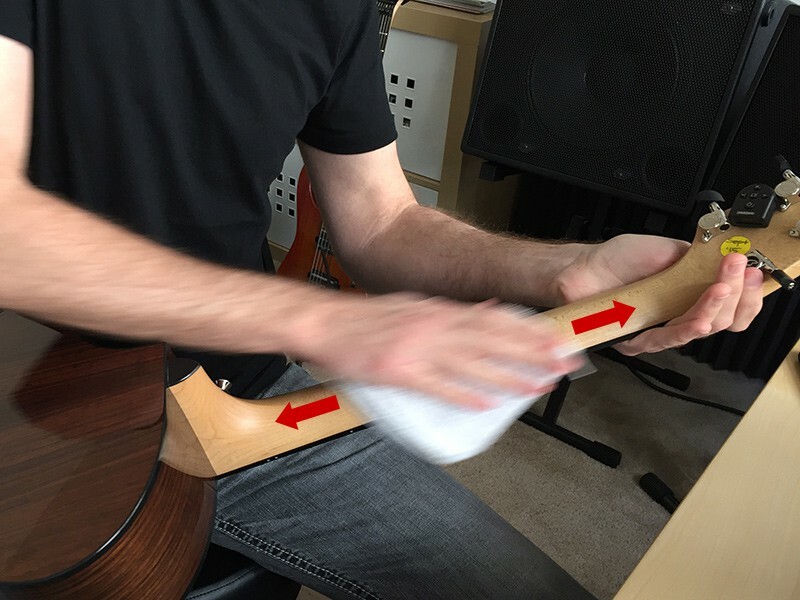 When gunk builds up in the porous wood of your fretboard or begins to erode the lacquer (if yours has a lacquered fretboard), it’s a lot more expensive to have cleaned and restored. 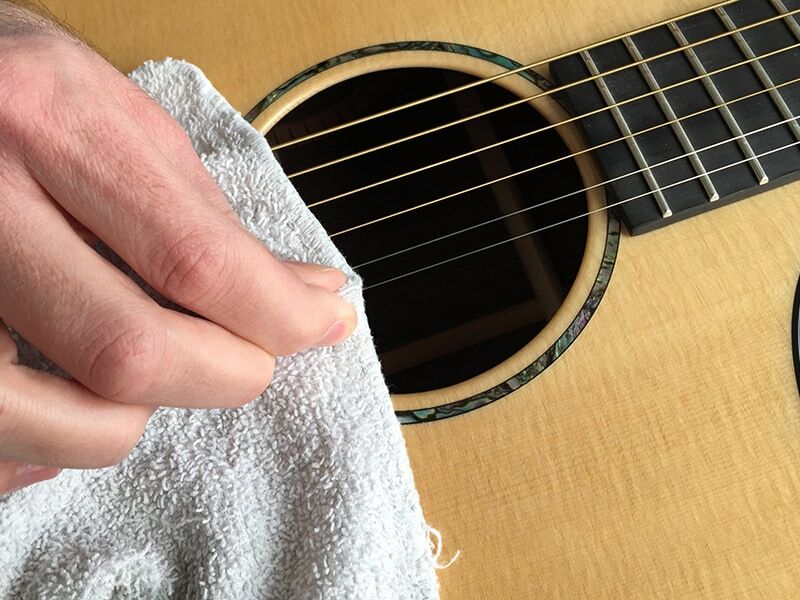 How Often Should You Clean Guitar Strings? As with many things, it depends–on how long you play, how much you sweat, and how dirty your hands were when you sat down to play. For now, let’s assume your hands don’t sweat excessively during play. 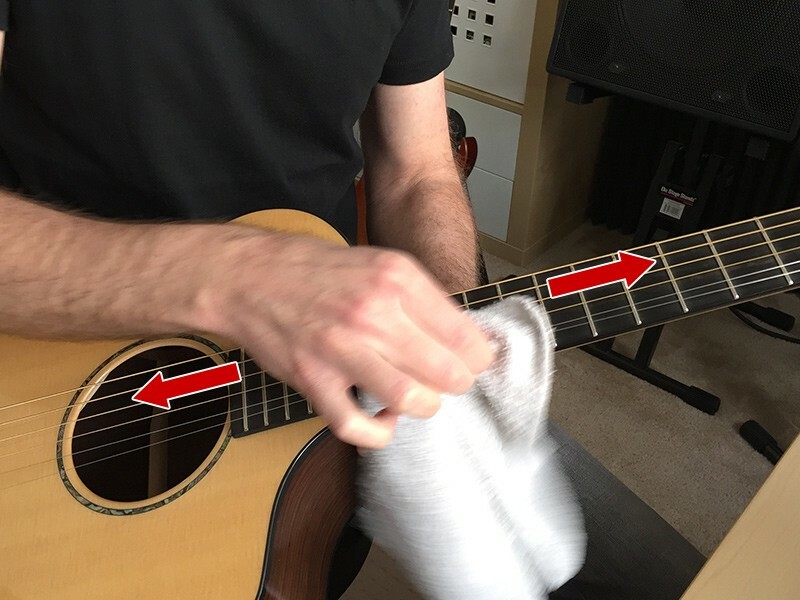 Washing your hands before you play (if practical) is just one more measure you can take to extend the life of your strings and guitar. If you only play for 15 minutes or less, you can get away with not wiping your strings and neck every single time and/or just use “the okay method” I’ll outline below. If you play for more than 15 minutes, then you’ll want to give your strings and neck a good wipe after each practice/play session. How thorough you need to be depends on just HOW LONG you play. All you really need is a soft cotton washcloth–the same type you use in the shower. 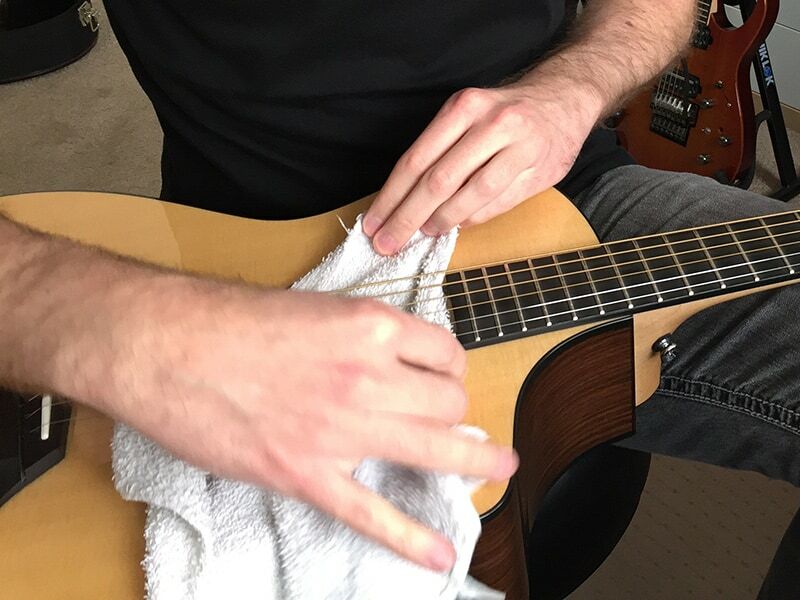 I prefer washcloths over old cotton t-shirts because I feel the little terry cloth loops do a better job of grabbing dirt and debris off the strings and fretboard. 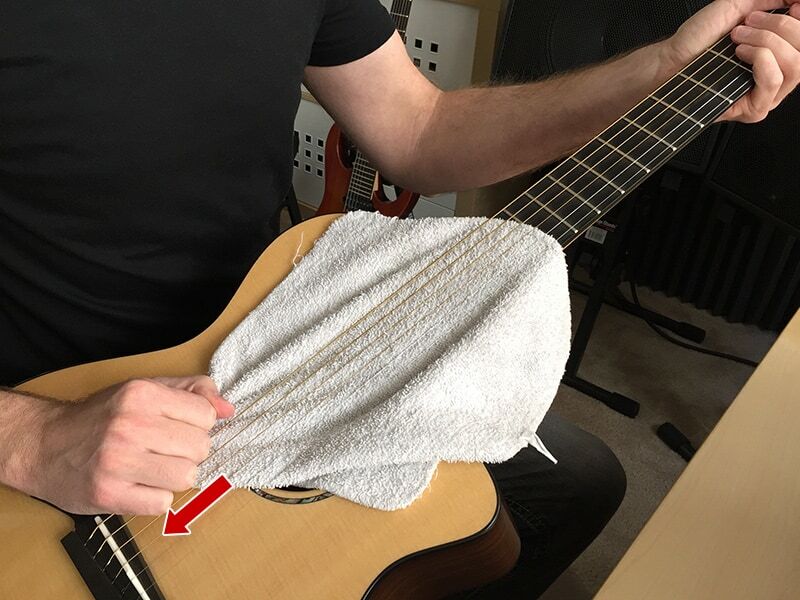 Store the towel inside the guitar case, or near wherever you tend to play guitar so that it’s handy when you’re done playing. You may be wondering about string cleaners. Don’t worry, I’ll talk about those later in this article and recommend a few you can try. Don’t have much time? 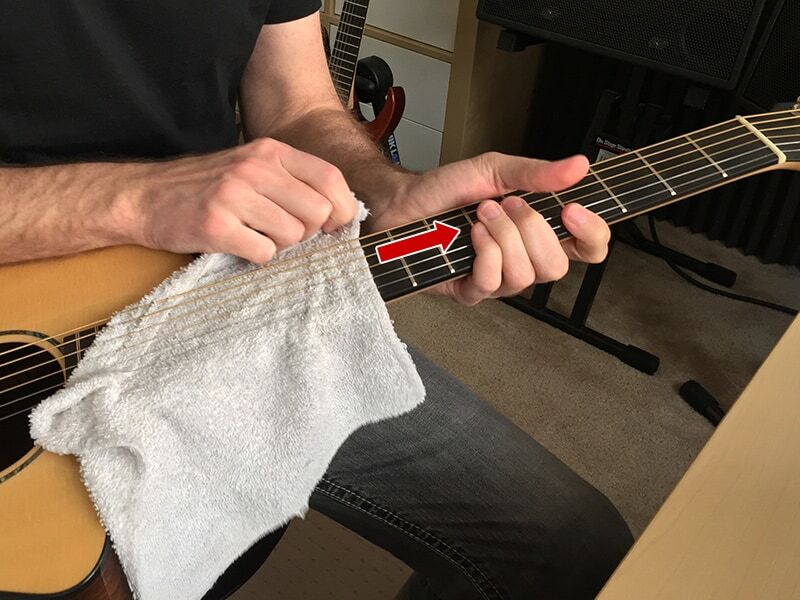 This method is not only quick, it won’t knock your guitar out of tune (as does “the best method” covered later). The downside is that it’s simply not as thorough–but definitely better than nothing if you want clean guitar strings. Just use a plain ole (clean) washcloth. No need for fancy wipes or microfiber towels here. The fretboard gets some contact with the towel as well, thanks to the terry cloth material. Despite the “action blur” here, I’m not wiping very fast. You don’t need to press hard either–light pressure is plenty. 3. Next, do the same on the back of the guitar neck and you’re done! You can use a little more pressure here, all the way up and down the neck 3-4 times is plenty. Notice the little yellow sticker on the back of my headstock? That tells me when I last changed my strings (helpful if you have a lot of guitars). And that’s it! Done! Toss the washcloth in the accessory compartment of your guitar case and go about your day. If you’ve got a little more time, or your strings and fretboard are especially dirty, this is the way to go. NOTE: This will knock your strings a little out of tune, so you’ll have to retune afterward. As you get close to the nut (where the strings pass over headstock to the tuning pegs), be careful not to pull the string out of the string groove. Do this sitting on the floor or couch–not setting on a chair like I am here. I only did this to pose for the photo, and I nearly dropped my guitar. … slide the cloth all the way to the nut. … then back down to the bridge. Do this 2-3 times. If you’re a beginner, you probably play on the lower part of the neck the most, so this area will tend to get the dirtiest. You can use a little more pressure here. Again, all the way up and down the neck 3-4 times is plenty. That’s it, really. That’s all you need for clean guitar strings. 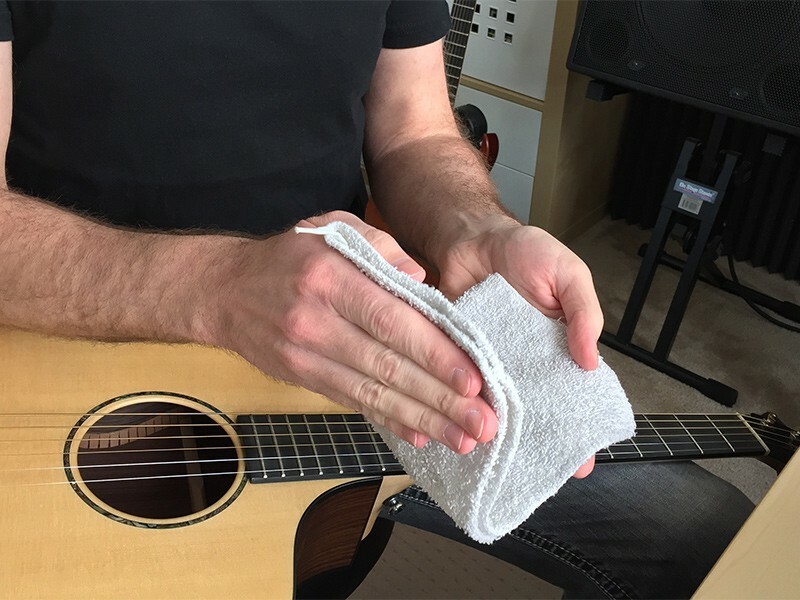 Toss the washcloth in the accessory compartment of your guitar case and be on your way. What About Guitar String Cleaners? I generally don’t recommend commercial string cleaners. Not because I think they’re bad or don’t work, but because I just don’t think they’re totally necessary. I feel that if your strings are really old or really dirty, you should just change them–because old strings can sometimes start to cause tuning and intonation issues, and really dirty strings just aren’t worth the effort… unless you’re using expensive 24k gold plated strings. However, string cleaners aren’t just a gimmick. They do have some limited effectiveness and are a good option if you want to squeeze a little more life out of your strings or just avoid changing them for a very long time. However, they’re not going to revitalize a severely rusted-out set of old strings. These cleaners are good for removing everyday sweat and grime only. That said, if you feel like you want to try a string cleaner, I’ve used GHS Fast Fret off and on since I was a teenager. It does a good job and leaves the strings feeling slick again. 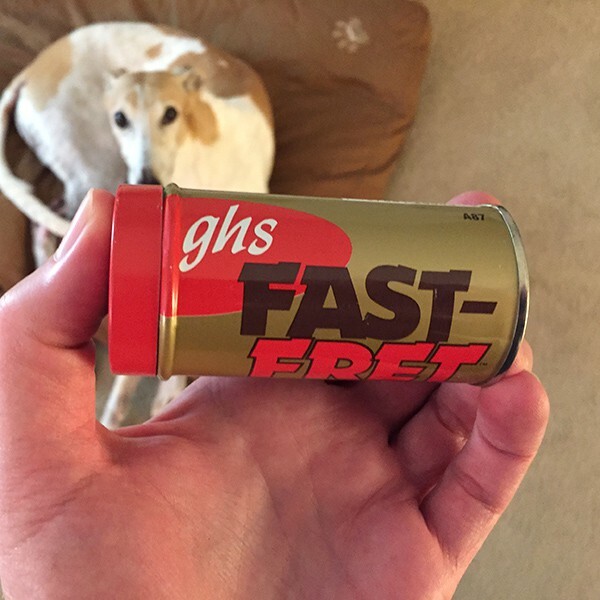 If you really want to use a string cleaner GHS Fast Fret is the one I’d recommend. Do you clean your strings? If so, do you use a string cleaner, or some other method? I’d love to hear how you keep your strings clean and shiny, so let me know in the comments below. I am glad to see the same methods I have been using since the late ’60’s. It does not take long to do and does extend the life of the strings. I do admit that often I don’t change strings as often as I should, of course 10 guitars are a lot. The sticker on the headstock is a great idea. Are they special low tack or just what you might find at the office supply? I usually write the date on one of the string envelopes and put it in the case. Lot of good info on your site. Thanks. Hi Lee. They’re just regular stickers that you can get at any office supply store. However, to reduce the stickiness I stick and unstick them from my clothing 2-3 times. This reduces the stickiness enough so that they don’t leave any residue on the headstock when I peel them off. Also, I don’t press them on very hard–just hard enough that they’ll stay. Great tip! Do you recommend string cleaner clothes that you can buy online? Also would be great if you had a blog on how to change strings on both a Floyd Rose type guitar and normal guitar. I don’t really think special “treated” string cleaning cloths are necessary, to be honest. It’s the same opinion I have of these other string cleaners too. They do work, but I personally just don’t need them because 1) I wipe my strings after I play and 2) I change my strings every 3-4 months anyway. I did once try a Blitz string cleaning cloth, and it worked really well. However, I found it to be a little messy (left oily residue on my fingers) and just generally required more effort than I thought was necessary. However, it’s cheap enough that you can check it out and see if you like it and, if not, you’re only out about ten bucks. 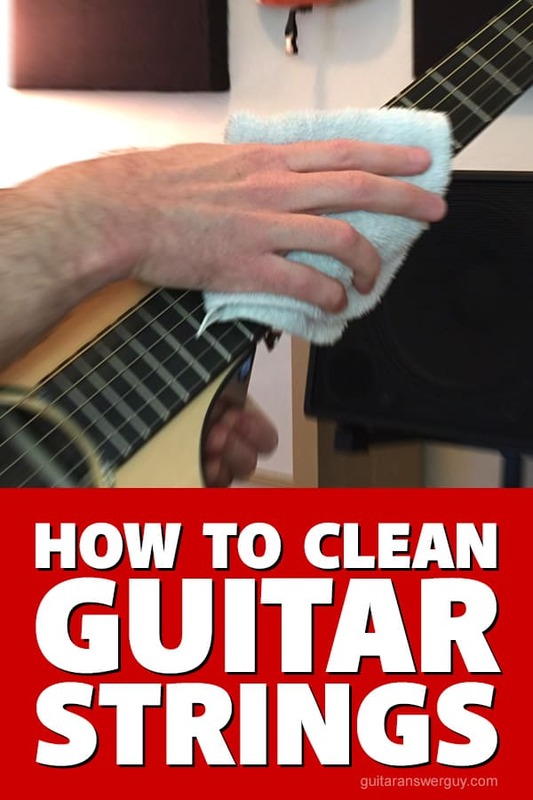 Thanks for these tips for cleaning guitar strings. You mentioned that you shouldn’t press to hard when cleaning. I’m interested to learn how much pressure is too much or if it depends on the conditions of the strings. 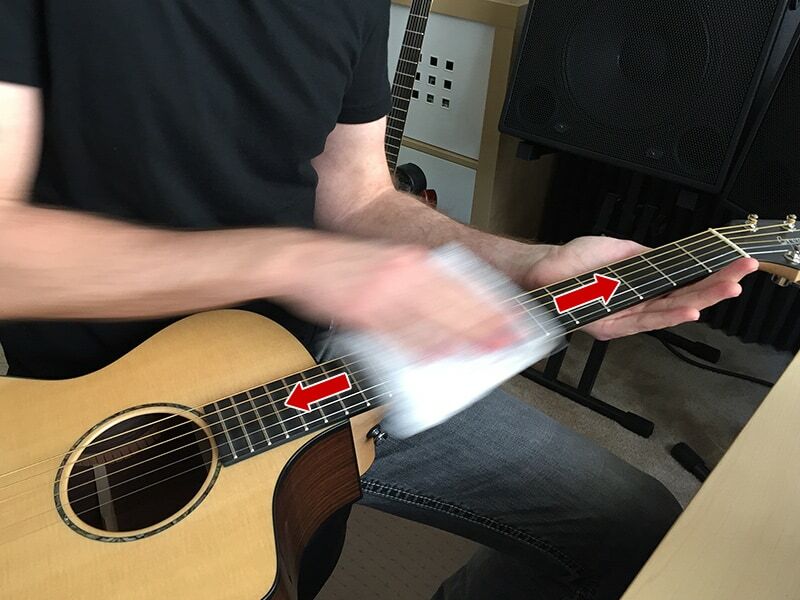 A very helpful blog with awesome tips to clean guitar. Thanks a lot. Thanks Lana. I’m glad you found the post helpful! Any questions, just let me know. Thanks a million for the string cleaning information… I purchased a Taylor gs mini from a guy that had only had it a month, he couldn’t get on with it for some reason, even though he had very small hands. He obviously played with a long sleeved pullover as the strings have a lot of nylon or wool fibres caught in the strings. I have failed to remove all of these fibres despite several attempts and wondered whether you could suggest something or am I better off replacing the strings? If you bought a guitar used, and the previous owner didn’t put a fresh set of strings on before the sale (which they should have), absolutely change the strings. You’ve no idea what kind of filth and germs the previous owner smeared all over them. I would tell you to do the same thing either way. Strings are a consumable item, so don’t get too attached to them. 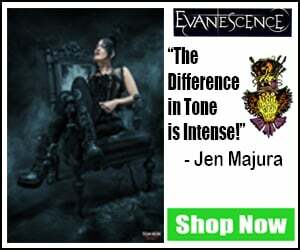 They’re temporary–not a permanent part of the guitar. Depending on how long and how often you pay, you may be changing them anywhere from once a week to a couple times per year. Just popped in to find out how to clean the strings on a used guitar I just got today. I liked your article, until I saw the pics of your dog. Then l loved it! I’ve got greyhounds too; they’re awesome! Question: this guitar (Peavey Composer electric/acoustic) has very sharp, almost unfinished frets. I need to unstring it to clean it, as it’s a bit dirty. Once it’s unstrung, what’s the best way to soften the edges on those frets? Hi Kathy. She’s our first greyhound, and she’s the best dog either of us has ever had. She’s so quiet (never barks), house trained, well-behaved, and very affectionate. We just love her to death–and her personality matches ours perfectly. Normally, when someone comes to me with what I like to call “razor fret” I recommend they first try the humidification procedure that I wrote about in this blog post. However, for you I’m going to recommend that you do go ahead and get those sharp fret ends filed down by a qualified tech or repairperson. It is possible to do it yourself, however, you run the risk of scratching your fretboard… not to mention you’ll have to buy tools that you may never use again. 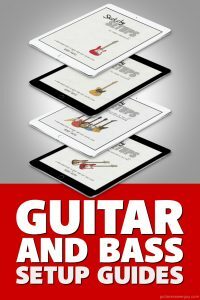 If you think you’d like to tackle it yourself, in that same article I just linked you, see the section titled “Still Got Sharp Frets?” That’ll link you to a tutorial on how the procedure is done as well as provide 3 Amazon links for the tools needed. But seriously, after all the time and money, you could’ve just paid someone to do it for you. I usually don’t recommend people purchase specialty guitar tools unless they plan to do a LOT of guitar work for themselves or for other people. I average 3 hrs/day/5d/wk practice. String cleaned dry then tried a cots “String fuel” system. Pro/works…con/evaporates on felt pad. I am likely too intolerant of string decay as mine rarely last 3 weeks. I have 3 “expensive” ones and a nifty hauler I just got but I tend to stay on each one until I stop hearing the clean and bright tones. The hauler will obviously bear the general abuse now (at least that’s the theory I am exploring) but I think given my acid, daily playtime and admittedly suspect “tone” neurosis, I want to settle on the daily dry and the deeper board clean and oil at string change. So I guess my point is: I like your article and guidance. I think it is a matter of experience until I feel like my jaggedy sand pearls up. I feel it is important to clean strings after each play and neck. But loopy cotton if you use a magnifying glass leaves micro pieces that eventually dampen the sound. just sayin… micro fiber for me. I am usually 100%on board with your teachings however having used several of the products you are recommending I wonder if it’s purely commercial endorsements? I didn’t like nor think those products are any good….I’ll send you mine if you want them. What about Finger Ease? I have used it for years and years…can’t complain one bit? Garry, I’m SO glad you asked about this, because it gives me the opportunity to remind everyone that I do not accept compensation in exchange for recommendations, positive reviews, etc. I would encourage you and everyone else to read my Affiliate Disclaimer and Earnings Disclosures page. I created that page because I think all bloggers, YouTubers, and similar content creators should be completely transparent about earnings, incentives, sponsorships, etc. That page lays it all out–probably more information than you ever wanted to know. I wish more people would disclose things that openly, but alas, I can’t control what others do. I can only set the example. I’m not a all surprised that you disagree with me. There is no product on the planet that will satisfy everyone. I’ve tried all 3 of these string cleaners over the years and liked them all. The GHS Fast Fret is my personal favorite, of the three. 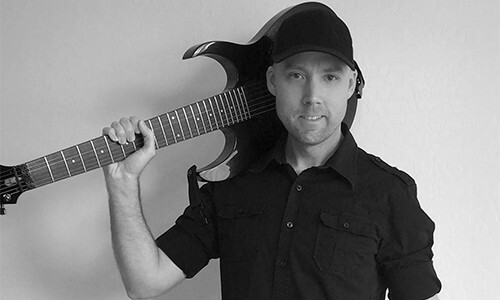 But at the end of the day, my opinion is still just my opinion, and just because I like something doesn’t mean everyone else in the guitar community necessarily will. In general, I don’t actually believe you need string cleaners–which I state in the article. Just a clean towel and some elbow grease. I think people really should just change their strings if they’re so dirty that you can feel the grit or hear the dullness. However, if someone really feels that they MUST buy a cleaner, I want to at least steer them in the right direction by recommending 3 cleaners I’ve actually tried and liked. I can’t recommend things I haven’t tried. As far as Finger Ease goes, well, I’ve never tried it, so I can’t recommend it. Also, Finger Ease isn’t really a “string cleaner” per se, which is what this article is about. I’ve heard good things about Finger Ease as far as it stoping string squeak and making playing easier, but that’s a slightly different topic than cleaning your guitar strings. Finger ease is a lubricant–not so much a string cleaner. We recently started recycling our old bath towels that we would have otherwise thrown out – making them into a replacement for kitchen paper. We keep it in a roll in the kitchen and it has poppers at each end so you can make a continuous roll. 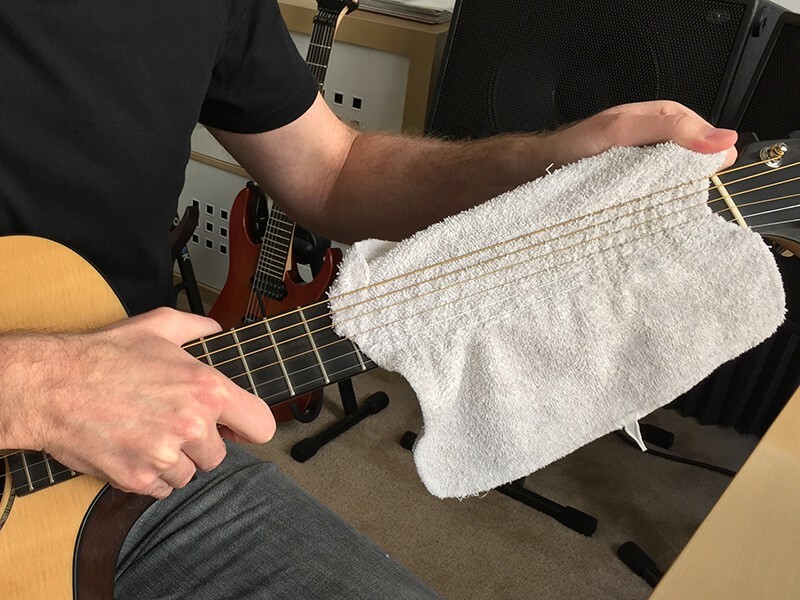 It turns out that old towels are a great material because it’s so absorbent, and I think it might be the ideal material to keep your fretboard clean too. We sew bias binding all the way round the edge of each piece because otherwise the towelling starts to fall apart. Soft cotton bath towels, washcloths, etc. are great for wiping fretboards and necks–which is exactly what I’m using in my photos in this post. I like the “terry” material because I feel the little loops get down into the grain of rosewood better.